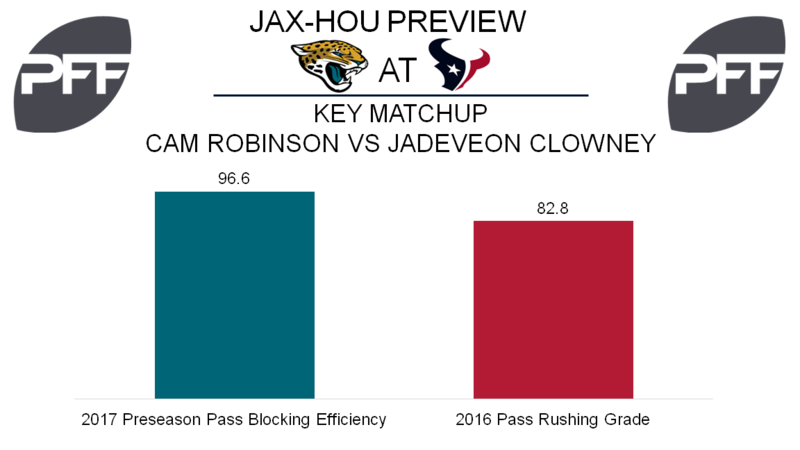 T Cam Robinson vs Edge Jadeveon Clowney – The rookie out of Alabama will be going up against Clowney who had a career best 58 total quarterback hurries and a pass rushing grade of 82.8 in 2016. In 73 pass protection snaps this preseason, Robinson allowed three total pressures, giving him a pass-blocking efficiency of 96.6. Robinson did struggle with run blocking finishing the preseason with a grade of 41.3. Last season, over 60 percent of Clowney’s pass-rushing snaps as an outside linebacker came from the right side. On those 205 pass rushing snaps, Clowney had 23 total quarterback hurries and produced a pass rush productivity (PRP) of 8.9. Jaguars right side offensive line vs. DI J.J. Watt -After back surgery forced him to miss most of 2016, Watt enthusiastically returns to the Texans. Watt does it all against the pass and the run. His most recent example was in 2015 where he had an overall grade of 94.9 to go along with a pass rushing grade of 94.4 and 87.4 against the run. The Jaguars lineman who figure to see him most often are guard A.J. Cann and tackle Jeremy Parnell. Parnell’s grade of 79.5 in 2016 was a career best, and he posted a team best 82.5 run blocking grade this preseason. Cann struggled this preseason in run blocking, but has shown some promise in pass protection. It wouldn’t be surprising if Marcedes Lewis is brought over to help often, but a strong start to the year by Watt could help decide the outcome of this game. RB Leonard Fournette vs LBs Benardrick McKinney & Brian Cushing – While Fournette didn’t show it on his nine preseason carries, at LSU he demonstrated the ability to run through tackles and become extremely tough to bring down when he had a full head of steam. For his college career, Fournette forced 137 missed tackles and ran for 1,874 yards after contact. In the running game, McKinney ranked 21st among inside linebackers with 18.0 tackles per missed tackle attempt, while Cushing finished 24th with 16.7. T Kendall Lamm vs. Edge Yannick Ngakoue – Ngakoue, who was second among all rookie edge rushers with 46 total quarterback pressures in 2016, is currently listed ahead of Dante Fowler on the Jaguars depth chart. While Ngakoue’s 2016 pass-rushing grade of 70.1 was a middle of the pack finish among edge rushers, his run defense grade of 31.9 was last among all qualifiers. With Duane Brown still holding out he’ll face Lamm. While he didn’t play enough snaps to qualify in 2016, Lamm this preseason had an overall grade of 60.3 on 88 snaps and recorded a pass blocking efficiency of 95.5 allowing three total pressures on his 50 pass protection snaps. Considering Ngakoue’s struggles against the run continued this preseason, it will be interesting to see if the Texans target that even in Brown’s absence. T Breno Giacomini vs Edge Calais Campbell – Giacomini gets the week one start at right tackle. For the majority of his career, Campbell has been an interior defender, but now moving to the Jaguars 4-3, he is slated to be an edge defender. Campbell’s pass-rushing from the position was on display this preseason as he recorded five total quarterback pressures on 25 pass rushing snaps. In 37 preseason pass-protections snaps Giacomini allowed five total quarterback pressures, making for a pass-blocking efficiency of 89.9 which was one of the lower figures among eligible tackles. Pass protection was an issue for Giacomini in the 170 snaps of it he played in 2016. 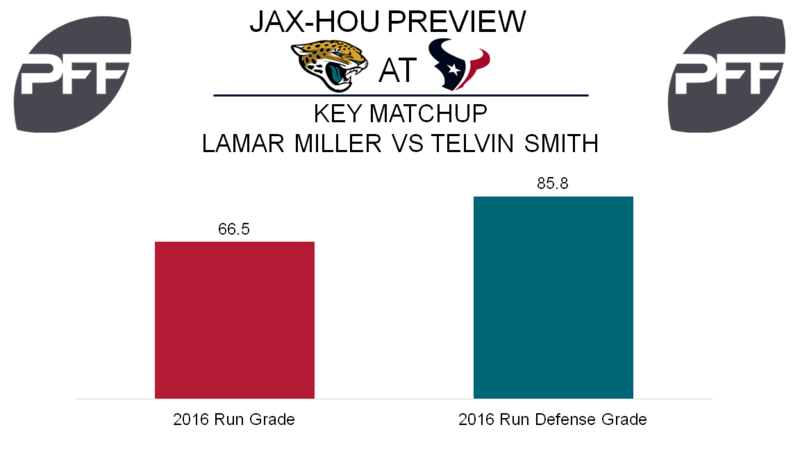 RB Lamar Miller vs LB Telvin Smith – Miller and Smith saw their run related grades go in opposite directions in 2016. Miller’s run grade of 66.5 was a career low, while Smith’s run defense grade of 85.8 was a new career best. Part of Miller’s grade could be due to his 1.9 yards after contact per attempt, also a new low. Smith led all 4-3 outside linebackers with 41 stops in 2016, and his stop percentage of 10.3 ranked second. With Smith’s 5.7 tackles per missed attempt in 2016 (27th out of 34 eligible), it will be key to see if Miller can get back to eluding contact early in his second year as the Texans’ lead back.